Mara Rockliff is the author of many books for children, including Mesmerized, illustrated by Iacopo Bruno, and the Golden Kite Award winner Me and Momma and Big John, illustrated by William Low. Mara Rockliff lives in eastern Pennsylvania. Iacopo Bruno is a graphic designer and the illustrator of Mesmerized. He lives in Milan, Italy. Velvet stage curtains, ship’s rigging, fellow audience members—all overlap the featured artwork, lending excitement and immediacy to this little known tale. The rich colors and embellished fonts, meanwhile, create a grandiose effect fitting for Adelaide’s life in the spotlight. Adelaide’s independent spirit is inspiring, whether she’s creating scandal by proposing to a man or donning risqué costumes...Pure magic. Rockliff tells Addie’s story with panache, the words bouncing across the page, with varying sizes and typefaces to highlight and emphasize important ideas. Bruno’s pencil and digitally colored illustrations are a homage to another time...Picture book biographies about groundbreaking women are always welcome, and this one is sure to please readers, young and old. Rockliff and Bruno (Mesmerized) reunite for another spectacular book about the often illusory world of human showmanship. Standout illustrations lend a magical aura as they spotlight the life of female magician Adelaide Herrmann...This charming and visually dramatic read gives children a front-row seat for the story of an ahead-of-her-time entertainer. The art makes the piece much more than simply a humorous biography of a spunky woman artist; readers get a taste of elite and artistic lives during Addie's lifetime. Addie's willingness to perform the feared-and-revered bullet-catching trick to retain popularity after Alex's death is a perfect way to end the entertaining, true story. An out-of-the-ordinary biography. This is the true story of Adelaide Herrmann, born Adele Scarsez in London, 1853. Not much has been published about the woman who practiced magic for 65 years, yet her story comes to life in this bold and brilliantly illustrated biography...The combination of illuminating text paired with magnificent illustrations ensures that this will be a popular book in every collection. Playful borders—velvet curtains, circus tent flaps, ship rigging—frame each spread, and thick white outlines create the look of paper-doll cutouts. It’s a memorable and, yes, I’ll say it, magical picture-book biography that will captivate audiences, young and old. Rockliff's spare, but exuberant narrative and Bruno's lavish illustrations speed through the story of the girl who began as a ballerina, moved on to bicycle tricks, met and married world-famous magician Alexander Hermann and joined his magic act. 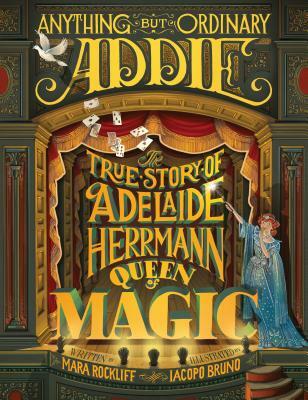 A fascinating true story of the fearless magician, Adelaide Herrmann, this choice oozes with courage and determination.